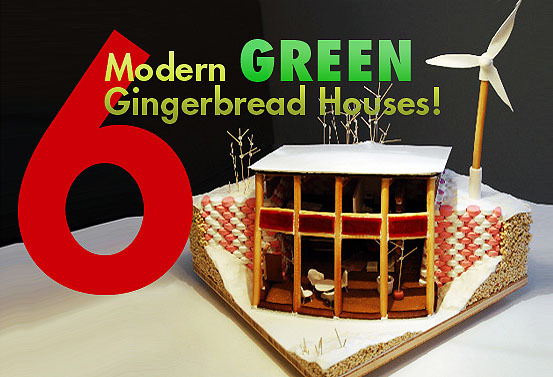 Top 6 Modern Green Gingerbread Houses! 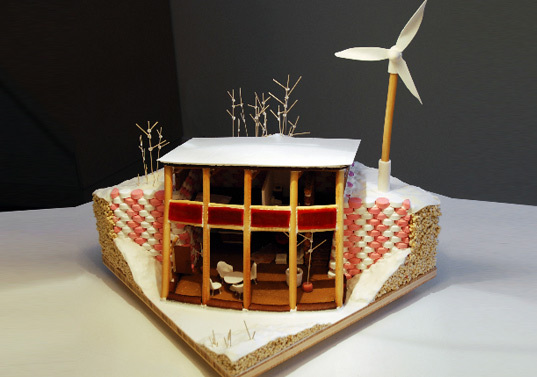 Top 6 Delectably Modern Green Gingerbread Houses! We've seen some pretty incredible examples of tasty green gingerbread houses served up over the years here at Inhabitat, so we thought it would be fun to do a roundup of our favorites so that they don't go stale. 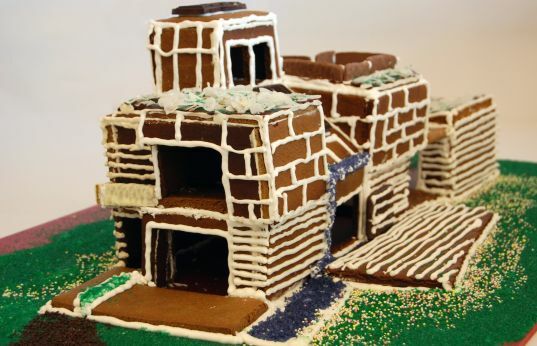 From our own green architecture writer Bridgette Meinhold's alpine gingerbread lodge to the aptly named Earthship Lollipop to prefab architect extraordinaire Michelle Kaufmann's own recipe for her Ginger Solaire house, click through our gallery to check out 6 edible homes that will get you hungry for green design. 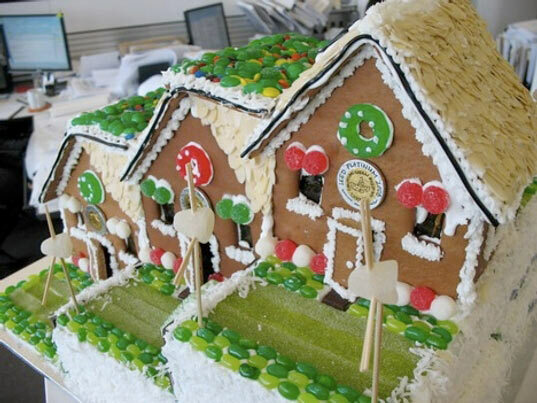 Did you know that gingerbread homes could achieve LEED certification too? We didn’t either until we saw HOK’s LEED Platinum home outfitted with Hershey’s Chocolate solar panels, gumdrop wind turbines and black licorice rainwater collectors. Sweet! 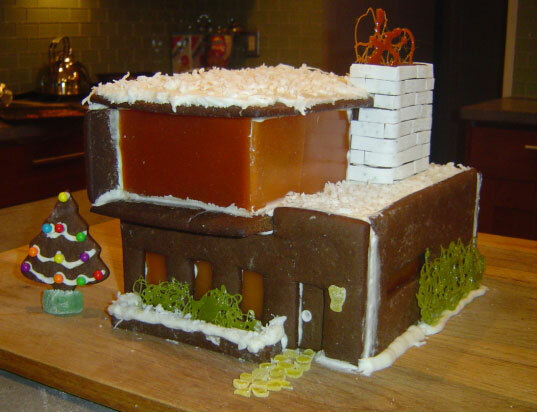 We’ve been following the prefab home designs of Michelle Kaufmann for some time now and that includes the edible versions too! The GingerSolaire was inspired by her mkSolaire, and she even shares the recipe and instructions for how to make your own here. What do you get when you pair up a furniture designer, an architect, some gingerbread and some frosting? Why, a tasty minimalist gingerbread home of course! This modern abode is the work of Liz Bruwin and Kevin Marx and features sugar glazed windows, sugar grass and a stylish gum-stick chimney. The Cake Study House 09 caught our house with its clean lines and minimalist appeal, and its yummy amenities kept us coming back for seconds. Made by architect and LEED AP Kristina Hahn Atelier, the sugary modern home features almond cacti, a pepper Palm tree, Toblerone stairs, hard gingerbread floors, cookie countertops and marshmallow furniture. Called the Earthship Lollipop, this delightful home by Khai Foo & Elise Young of Solus Decor and Eastside Design has a rammed-icing English Mint wall with high Cocoa-mass qualities to mitigate sweet-loss. Even cooler? The design was submitted to a competition to raise funds for Architecture for Humanity. We don’t often like to toot our own horns but in this case, toot toot! This sweet gingerbread alpine cabin was crafted by our very own contributing writer Bridgette Meinhold, and we couldn’t be prouder! In true green form, the cabin has eco-friendly building elements like a solar roof and composter, and looks a lot like Bridgette’s own lovely house in the woods. 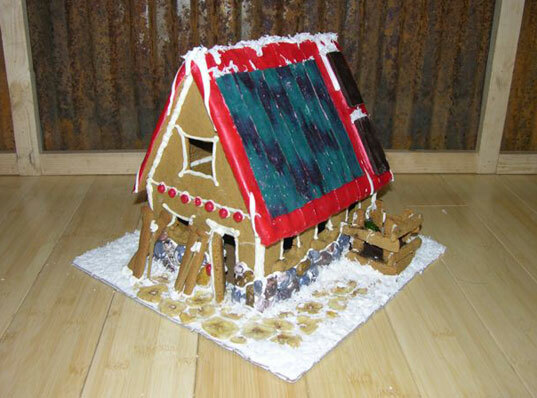 HOK LEED PLATINUM GINGERBREAD HOUSE Did you know that gingerbread homes could achieve LEED certification too? We didn't either until we saw HOK’s LEED Platinum home outfitted with Hershey’s Chocolate solar panels, gumdrop wind turbines and black licorice rainwater collectors. Sweet! MICHELLE KAUFMANN'S GINGER SOLAIRE We've been following the prefab home designs of Michelle Kaufmann for some time now and that includes the edible versions too! The GingerSolaire was inspired by her mkSolaire, and she even shares the recipe and instructions for how to make your own here. 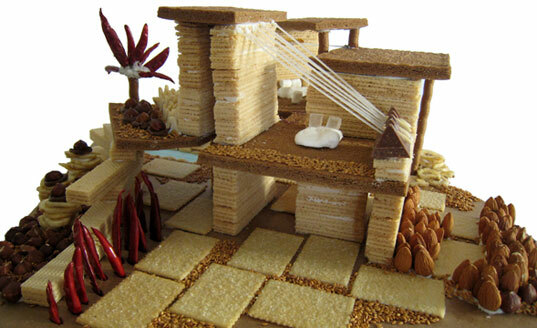 We've been following the prefab home designs of Michelle Kaufmann for some time now and that includes the edible versions too! The GingerSolaire was inspired by her mkSolaire, and she even shares the recipe and instructions for how to make your own here. EARTHSHIP LOLLIPOP Called the Earthship Lollipop, this delightful home by Khai Foo & Elise Young of Solus Decor and Eastside Design has a rammed-icing English Mint wall with high Cocoa-mass qualities to mitigate sweet-loss. Even cooler? The design was submitted to a competition to raise funds for Architecture for Humanity. MODERN LA CAKE PAD The Cake Study House 09 caught our house with its clean lines and minimalist appeal, and its yummy amenities kept us coming back for seconds. Made by architect and LEED AP Kristina Hahn Atelier, the sugary modern home features almond cacti, a pepper Palm tree, Toblerone stairs, hard gingerbread floors, cookie countertops and marshmallow furniture. GINGERBREAD ALPINE LODGE We don't often like to toot our own horns but in this case, toot toot! This sweet gingerbread alpine cabin was crafted by our very own contributing writer Bridgette Meinhold, and we couldn't be prouder! In true green form, the cabin has eco-friendly building elements like a solar roof and composter, and looks a lot like Bridgette's own lovely house in the woods.